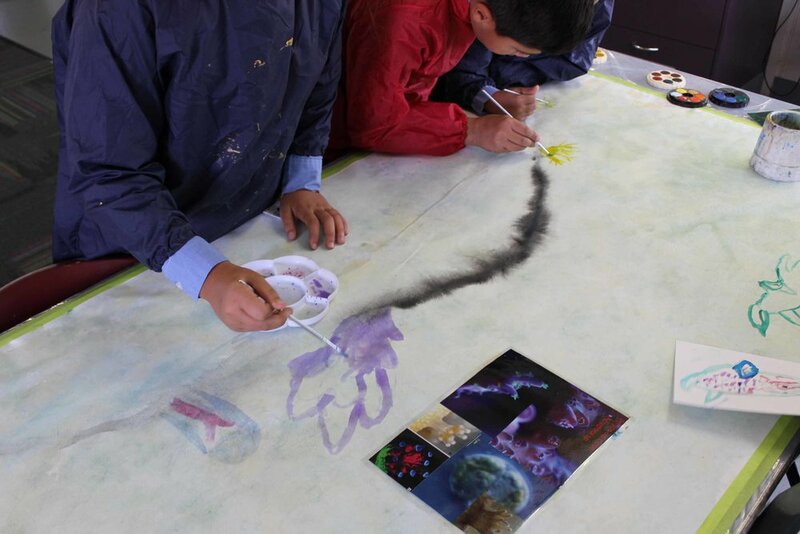 Collaborative Drawing is used as a tool for thinking, connecting, doing and exploring. This experience encourages ideas to emerge through a creative process of drawing, painting and doing whilst simultaneously encouraging a group response to each other, a deeper awareness of each other and insights into other peoples process. This hands on process unlocks vulnerabilities, encourages disruptions and fosters collaborative responses to a changing experience. It also enhances learning opportunities through storytelling, visualisations and imagination. This process can be designed for corporate, community and educational sectors. Theme: Illustrating time: Past, present and future. 2 days. 100 people. Drop in community session during writers festival. Photo courtesy of FORM, Scribblers Festival 2018, by Taryn Hays. Afternoon session. 20 people. Team building amongst adults. Afternoon session. 30 people. Making as thought process. Afternoon session. 20 people. Team building & knowledge processing. In collaboration with Scale Free Network. Images by Briony Barr.